I've done it. 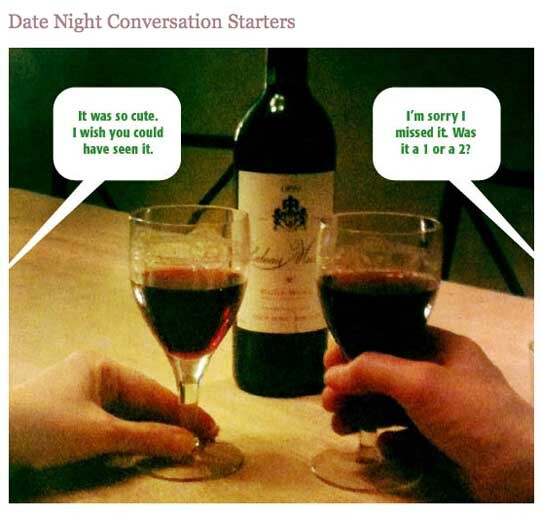 I've put together a list of 3 dozen date night questions inspired by a post I did on ohdeedoh. I included a bunch of links with thought starters for making one's own list. Which I've now done. And I know I'm being a geek about it but I'm looking forward to taking it on a test run. What is the grossest thing you’ve ever had to do? The craziest? If you could bring a fictional character to life in order to save the world right now, who would it be? If you could keep only one memory of your past what would it be? What historical event would you like to have been a part of? How has the world changed the most since you were a kid? What do you wish hadn’t changed? What is one of the most romantic times we’ve had together? What is your favourite memory of the two of us together before babies? Second favourite? Who are the friends that you wish you still had? What do you think is my most embarrassing moment, since we’ve known each other? What would each letter in your first name stand for if you made an acrostic out of it? In what ways do you like to be shown appreciation? How would you describe an ideal day? Ideal weekend? What is your greatest fear? What other fears do you have? Lately, what has preoccupied your thoughts? What is the best compliment I could give you? If you were a geometric shape, what would it be? What’s your favourite kind of meal? What’s your top 5? Top 5 desserts? What’s your favourite restaurant? What are your top 5? What things stress us the most? How can we change that? Who do you think will go senile first, you or me? If we had two days alone together, how would be your ideal way of spending them? Would you ever consider wearing matching outfits? What could I do to best help you in the next 30 days? What would you do right now if you found out you had one day left to live? What about 6 months? In what way would you like to grow in the next year? In what way would you like to see me grow in the next 6 months? If you could change one room in our home what would you do with it? What’s the first thing you would do if you won $10,000? What about $100,000?